Abstract: Objective To investigate the expression and clinical significance of TMPRSS4 expression in gastric cancer. Methods TMPRSS4 expression was evaluated in 30 normal mucosal and 30 gastric cancer tissue samples using real-time quantitative polymerase chain reaction (PCR) and in 30 cases of normal mucosa, 18 cases of gastric dysplasia, 122 cases of primary gastric cancer, and 22 cases of distant metastatic site using immunohistochemistry. The correlations between TMPRSS4 expression level and clinicopathologic factors were analyzed. Results Real-time quantitative PCR revealed that TMPRSS4 expression was significantly higher in gastric cancer tissues than that in normal mucosal tissues (P=0.035). 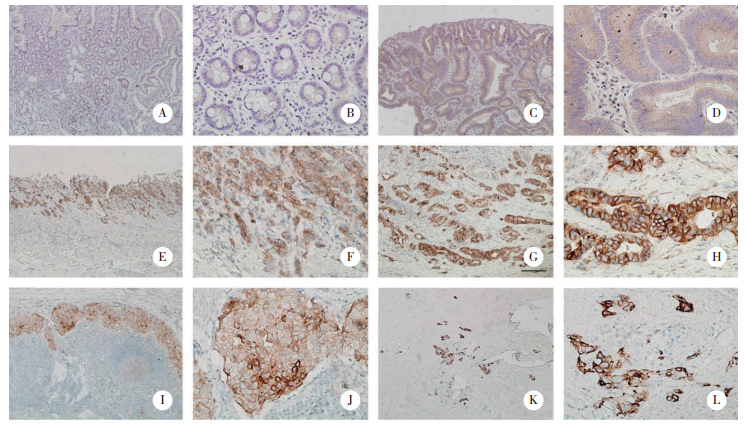 Immunohistochemistry showed significantly more TMPRSS4 expression in primary gastric cancer and distant metastasis tissues than that in noncancerous tissues, and a gradual increase was seen with increasing clinical staging (P < 0.01). TMPRSS4 overexpression was associated with tumor size, lymphovascular invasion, tumor invasion depth, lymph node metastasis, distant metastasis, and tumor, node, metastasis (TNM) stage (P < 0.05). 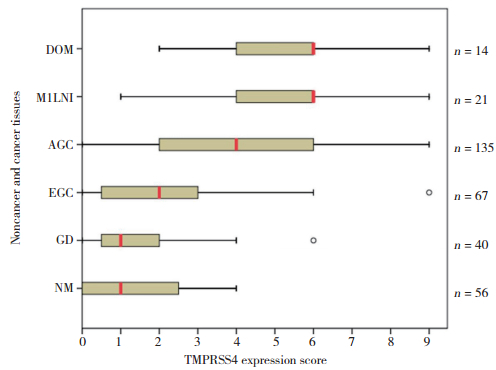 Multivariate Cox regression analysis with the adjustment for TNM stage revealed that TMPRSS4 expression was an independent poor prognostic factor (HR=2.72, P=0.005). 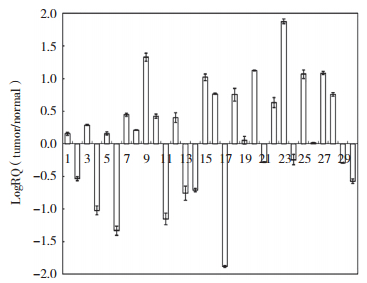 The index score of TMPRSS4 expression of the primary tumor showed a significant linear correlation with that of distant metastatic site (β=0.307, R2=0.143, P=0.025). Conclusion TMPRSS4 overexpression is a novel biomarker for estimating gastric cancer progression. The tumor biological context of TMPRSS4 may affect and participate in tumor metastasis.